As I’m sure you know by now, LinkedIn is my absolute FAVORITE social media site! Not only does it allow me to connect with you, but also it is one of the fastest growing these days among small business owners and entrepreneurs, and I’ll tell you why. With all the social media sites coming up and trying to take over these your day, there’s not one that has compared with LinkedIn! It’s professional; lets you network like CRAZY, has a HUGE reach for business, and is pretty simple too. Those are just some of the basics. 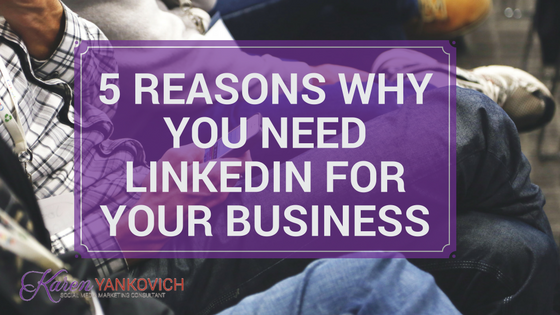 Let me tell you the 5 reasons why you really need a LinkedIn profile for your business. This is it in a nutshell right here. Google is the way that people search your business online, and if you have a LinkedIn page, there’s no doubt it will show up in the search right after your website. If people want to contact you, they aren’t seeking out your “contact us” page on your website. But when they Google search you and see your LinkedIn page, they know they can see a more personal side of your business there. Go ahead, check it out! LinkedIn is different from any other social media because it’s where you can tell everyone EXACTLY what you want them to know about your business. You can customize anything you put on LinkedIn, whether it is in networking groups, job posts or even promotions. You have all the tools you need to target any audience, and let them know exactly what your business is about at the click of a button. As business owners, we all want to establish our credibility, have a relationship with our clients, and be influential, right? When it comes to LinkedIn, you have the added capability to position yourself as if you are peers with the most influential people in your industry! The sharing power is tremendous. Making connections with top industry leaders and networking in groups to gain tips and trust among your peers have never been easier. Your clients will then know you are associated with a high level of expertise and credibility that you just can’t gain from any other social media site. The first thing you should do at a networking event or when meeting someone is to get his or her business card, right? LinkedIn is basically your social media, online business card. People can forget they have business cards, not return a phone call or an email that’s listed, but when you connect with LinkedIn, you won’t be forgotten. You can connect immediately and reach out to whomever you want! Go ahead, endorse them, recommend them, and connect with them on a more professional level to build that relationship. It’s that easy and all without having to meet face to face, which, let’s be honest, is pretty hard to find time to do these days! Let’s face it, the entire world has gone digital! LinkedIn is the one digital platform that helps you reach your next client and quickly! People are on LinkedIn to look for jobs, post jobs, look for business help, and so much more. With just a little bit of search and promotion, your business can attract top clients and let you into their world so you know you are recruiting the best. LinkedIn is the one platform that gives you all the information you need to know about your client, so you might as well use it! Need more tips on boosting your LinkedIn profile? Sign up for free and join my LinkedIn Group Profitable Social Media Tips for an invite to my FREE 21 day challenge: LinkedUP Revolution.